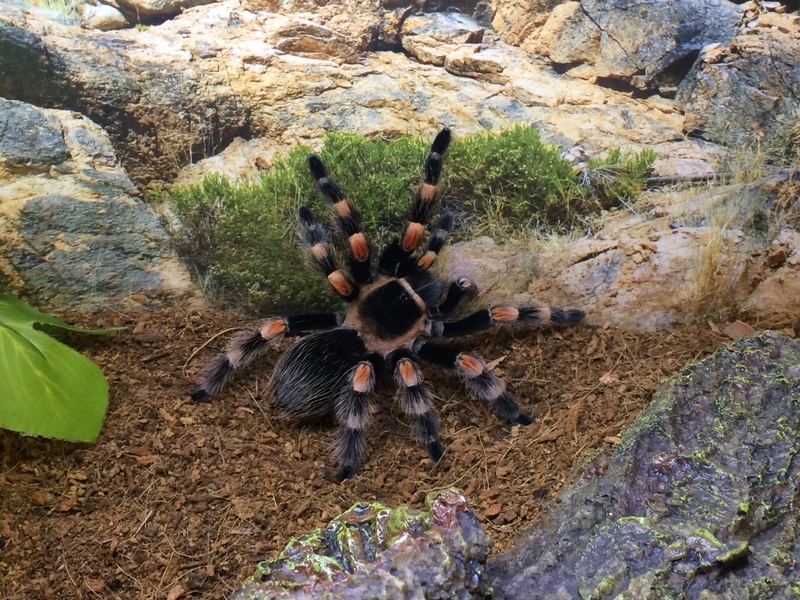 One of my favorite tarantulas is the Mexican Red-Knee (Brachypelma harmori, formerly smithi). 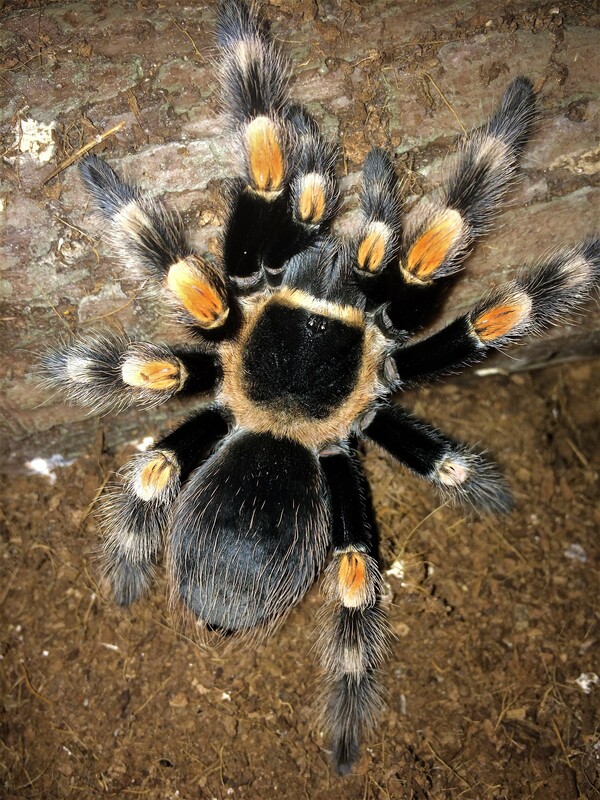 I am a huge fan of the Brachypelma genus but in 1977, when I got my first tarantula, it was a harmori so to this day this species holds a special place in my heart. Just recently, one of my three harmoris moulted and as I was admiring the stunning colors, I thought to myself that it was a shame that so few people get to appreciate the beauty of this species. So, I decided to set up a showcase enclosure for it. A couple of years ago I acquired an Exo-Terra HabiSphere and it just sat in storage. I knew I wanted to set up a nice display but was unsure as to what species to showcase. There were so many choices but I knew it had to be something that when people saw it, they would say “WOW!” The HabiSphere is a unique set-up as it is designed to be somewhat compact and it features a curved front that maximizes viewing potential. Some other cool features about this enclosure are the energy saving built in LED lights that can simulate daytime and nighttime at the push of a button. 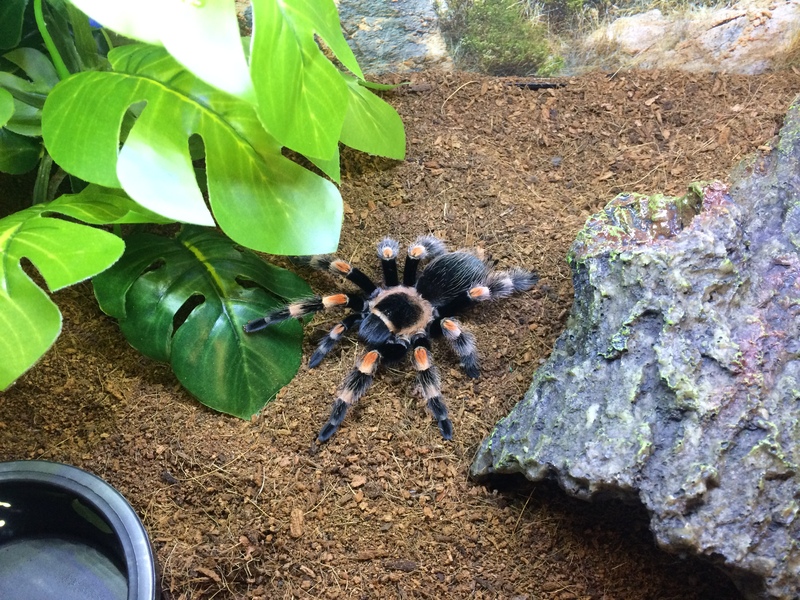 Though tarantulas have little use for lighting, it’s handy to have when showing off your enclosure to guests. There is also a provided two-sided back drop that either represents a desert environment or a rainforest environment, depending on what kind of animal you are displaying. 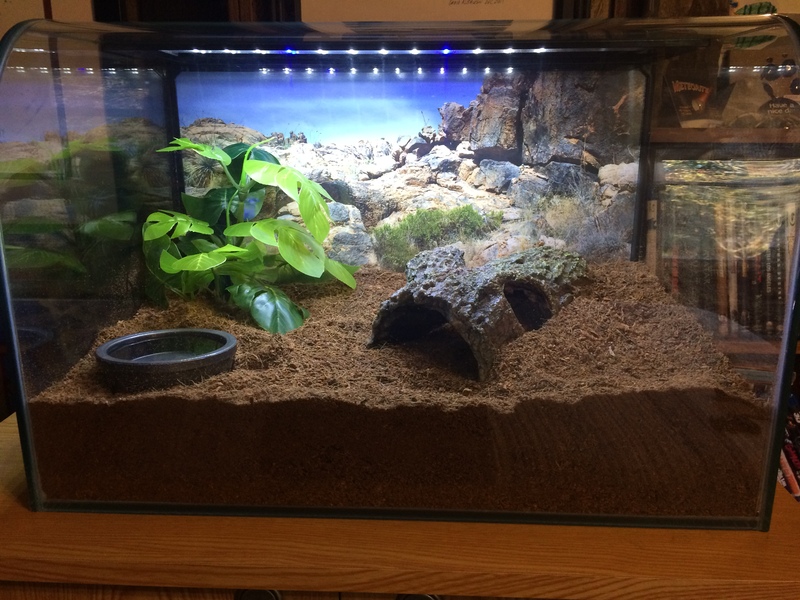 I opted for the desert background here since Brachypelma are desert species. 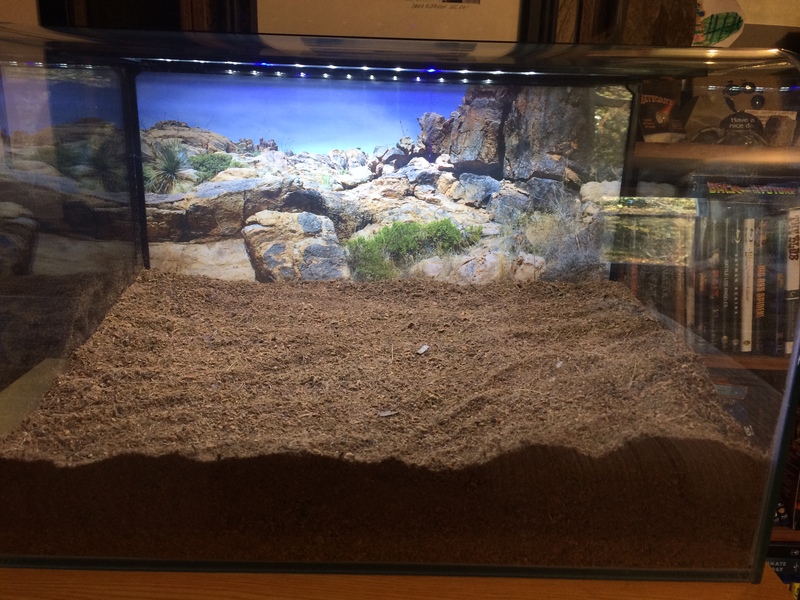 I started setting up by adding eight quarts of dry Zoo Med Eco Earth, my preferred tarantula substrate. If I was going to house a tropical species, I would’ve used the bricks that expand in water, providing a higher humidity substrate. Since I am displaying a desert species I opted for the dry material. In my experience, when introducing a dry-loving species to a damp substrate, they try to climb as high as they can to stay off of it. Eight quarts provides a depth of about 3″ in the front and 4″ in the back. From there I added a fake plant (I had bought two but in the end felt it would be too crowded to have too much greenery). I was going to use a fake cactus, to simulate the desert, but opted not to as even fake cactus can have sharp or hard edges that could be harmful to the tarantula. I then added a medium Bark Bend by Zilla for a hide. These beautifully replicate the look of a dead piece of a tree and in my experience, Mexican red-knees are more opportunistic with their homes and are not necessarily burrowers in captivity. From there I added a water dish and then the tarantula. Now it will be a waiting game to see if she likes it. Most tarantulas, when introduced into a new home, will slowly explore their new surroundings and usually, when they feel comfortable, will start rearranging things! Often times plants will be dug up and water dishes will be filled with substrate. It’s been awhile since I set up a display like this and I look forward to hearing feedback. 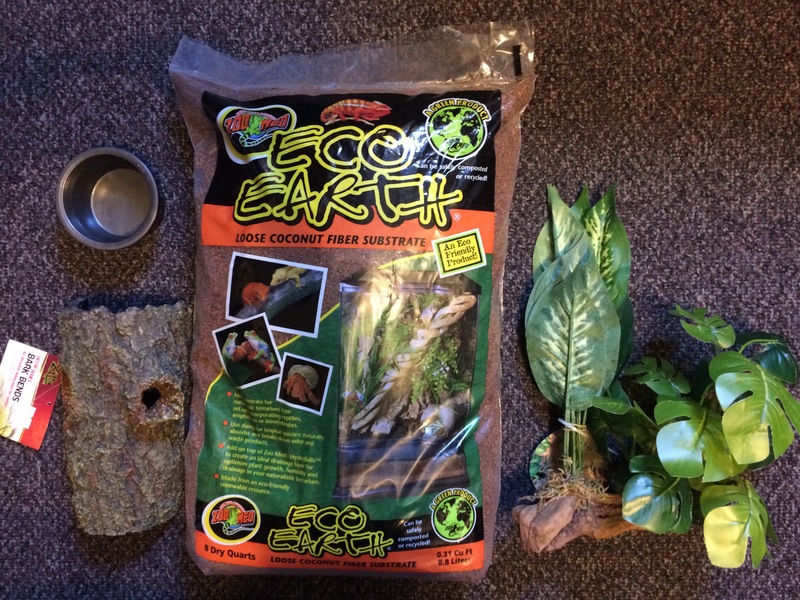 This entry was posted in Breeding Boxes, Exo Terra, Tarantulas and tagged Brachypelma, Eco Earth, Exo-Terra Breeding Boxes, Habisphere, harmori, smithi. Bookmark the permalink.